Photograph, signed. A real photograph postcard with good autograph signature and inscription by Louis Noel "Hendon 7th Feb 1914, Yours very sincerely, Louis Noel". 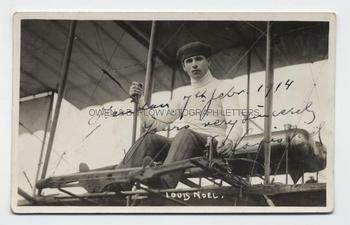 An excellent portrait showing Louis Noel seated in what we think is a Claude Grahame-White bi-plane at Hendon. Louis Noel was born in Paris but came to England to work for Claude Grahame-White's company at Hendon, where he became one of the aerodrome's chief test-pilots and demonstrators. Shortly after war was declared in 1914 he returned to France and served throughout the war in the French military air force. It is not known what became of him subsequently but it he is believed to have emigrated to Eastern Europe. A scarce autograph.